What kind of education does he/she have? This is a great question because some trainers can get away with having very little education related to fitness. Even if the trainer is in great shape it does not mean he/she knows the proper form and safety measures when teaching exercises. Only make exceptions for those who have many years of experience and no lawsuits. What is his/her specialization? 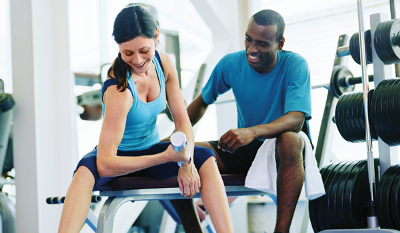 Many trainers target and specialize in certain sports and/or goals that clients are interested in. Look for a trainer that specializes in the goal that you are trying to achieve and ask if you can contact any of his/her former or current clients for their opinion. Dose he/she now hold a CPR and AED certification? To many people do not care to ask this question because they do not believe that they will be in need of CPR or AED. The fact is that over 92,000 people are saved by CPR each year; while that number may be high, it would be even higher if more people were certified. How much experience does he/she have? Many times this is regarded as the most important piece of information to know when choosing a personal trainer because it is believed that the more years a trainer has been around the better he/she will be. While this may be true to a certain extent, it isn’t completely. Some trainers spend their entire lives training thousands of people with outdated practices they learned years ago. Sometimes it may actually be better to hire a young personal trainer who has been educated on the modern methods of personal training. Not many people can afford switching from personal trainer to personal trainer, which is why knowing the right questions to ask is essential. Questions that help show the trainer’s education, safety, experience, and specializations. These questions would also be helpful when searching for an online personal trainer as well. Whatever you decide to do, remember to always ask questions!